THE News & Mail has found a forgotten Woking-born 1960s pop star in a search that was prompted by letter from a reader. Earlier this month, John Cotter of Sunbury-on-Thames, wrote to us recalling seeing Kevin Kirk in a concert tour that included Joe Brown and The Crystals, the US female vocal group whose hits included He’s a Rebel, Da Doo Ron Ron (When He Walked Me Home) and Then He Kissed Me. John said he still had the programme from the 1964 concert and wondered if any readers might know whether Kevin Kirk was still alive and where he might be. It turns out that Kevin, real name Barry Willison, is very much still alive and living in Hove, where he has revived and expanded his musical career after a big lull that came after some early success. Barry, 74, was born on October 11 1942 in the Woking Maternity Hospital, which was then in a former house called Wynberg in Oriental Road. He knows very little about his parents, Frederick and Joyce (nee Last), and remembers living in Streatham, South London, shortly after the war. It might be that Barry’s pregnant mother was evacuated from the capital during the war. Barry said that the idea to become a singer began in his early years at school. After leaving school, Barry went for some auditions at various London nightspots to be a resident singer. “At one, there was this bloke sitting in the corner. He heard me and told me not to go ahead with the audition as he had a better idea,” Barry says. Barry was surprised to learn that Wynter was also born in Woking after his mother was evacuated during the war. Without any explanation, Mackender told Barry to use the name Kevin Kirk and organised a two-record deal with Columbia and the six-week nationwide tour called Your Lucky Stars, featuring some of the biggest pop acts of the time, which is where reader John Cotter saw him. The programme shows that the fellow performers included Manfred Mann and Heinz, best-known for his 1964 hit Just Like Eddie. After the tour, Kirk spent several months performing in the top clubs in Hamburg, rubbing shoulders with The Beatles. One of his drummers was a predecessor to Ringo Starr in the band. Sadly, Kirk did not go on to have the success of the acts around him and Barry says that his career suffered a “big lull” during which he was married and divorced three times and experienced close family tragedy. During what he describes as a “life of turmoil” Barry gave up music and ended up living in Reigate, working as a school caretaker for many years. 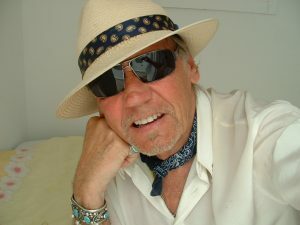 The group persuaded Barry to re-record some of his Kevin Kirk hits on YouTube and the experience inspired him to expand his musical repertoire. 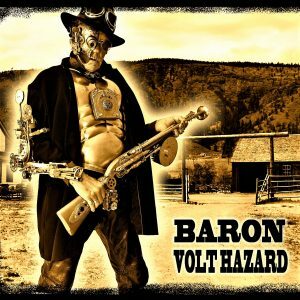 He later moved to Hove and, alongside his pop music, has moved into “Steampunk” in the persona of Baron Volt Hazard and is soon to perform techno as DJ Sonic Boom Bazz. His work, old and new, has been given a new audience thanks to YouTube. “I’ll do anything to do with the arts,” says Barry, who has a sizeable portfolio of paintings and has done a lot of photography. He seems to have blended in well with the bohemian side of Brighton and Hove and, ever active, has written and performed English versions of Greek songs written by a bar owner he met on holiday in Mykonos. As for the heady days of the early 1960s when he was touring with international pop stars, Barry says he looks back on those days “with a big smile”. He spent a lot of time with the stars and says he got on very well with Heinz, who has been portrayed as difficult.